Israeli Prime Minister Binyamin Netanyahu, on a trip Thursday to Lithuania, welcomed the decision by major international airlines to end their direct flights to Iran’s capital of Tehran in September. The decision by British Airways and Air France came after President Donald Trump withdrew from the nuclear deal between Iran and began restoring U.S. sanctions. The move has been exacerbating a financial crisis in Iran that has sent its currency tumbling. British Airways said its last flight to Tehran will be Sept. 22, with the return on Sept. 23, while Air France said it would end flights from Paris to Tehran on Sept. 18. Netanyahu spoke hours after arriving in Lithuania for a four-day visit in which he will also meet his Latvian and Estonian counterparts. “That’s good. More should follow, more will follow, because Iran should not be rewarded for its aggression in the region, for its attempts to spread terrorism,” Netanyahu told a news conference. Netanyahu, making the first visit to Lithuania by an Israeli prime minister, was welcomed by Foreign Minister Linas Linkevicius at the Vilnius airport. 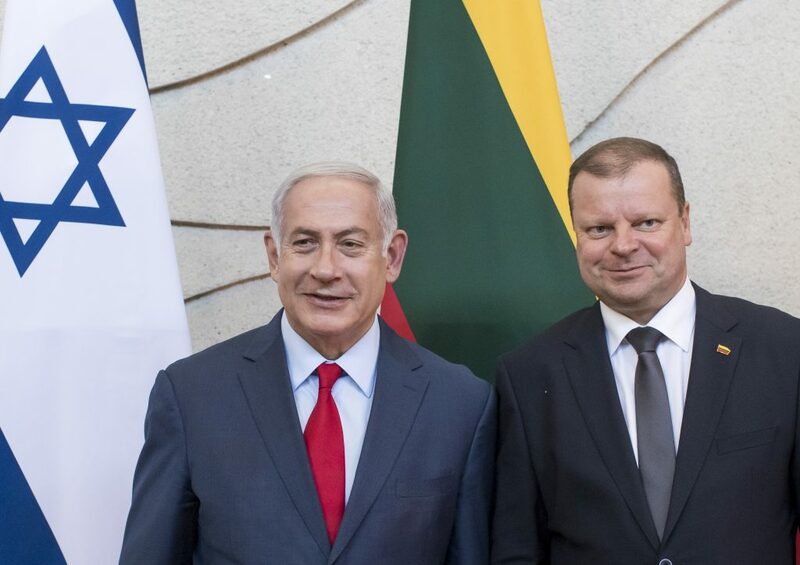 Lithuanian Prime Minister Saulius Skvernelis and Netanyahu were holding bilateral talks on Thursday evening before being joined by their counterparts — Estonia’s Juri Ratas and Maris Kucinskis of Latvia — on Friday. Later that day, he will meet with Lithuanian President Dalia Grybauskaite. Lithuania has not followed Washington in recognizing Jerusalem as Israel’s capital and supports Iran’s nuclear deal despite Israeli and U.S. opposition. “This visit is a very good chance to build further the strategic partnership both countries have demonstrated an interest to develop,” Marius Laurinavicius, a senior expert at the Vilnius Institute for Policy Analysis, told The Associated Press. The Baltic nation of nearly 3 million was part of the Russian Empire before declaring its independence in 1918. Lithuania was then independent until 1940, when it was occupied by the Soviet Union. It regained its freedom in 1991 and joined the EU and NATO in 2004. Netanyahu has roots in Lithuania — his mother’s parents lived in the central village of Seduva. Over 90 percent of Lithuania’s more than 200,000 Jews were killed in the Holocaust. The role that Lithuania played in those deaths is sensitive, as the country mainly views itself as a victim of Nazi and Soviet occupations. During his visit, Netanyahu also will attend a memorial ceremony at the site near Vilnius (Vilna) where tens of thousands of Jews were killed by Nazi troops and Lithuanian collaborators. He will also meet with relatives of Lithuanians who aided Jews during the war and will visit synagogues.